I have tremendous respect for Mr. Buffett. But every word that comes out of his mouth should not be looked upon as prophecy, or the gospel truth. I get a feeling that Buffett has been canonized into a value investor saint – investors and the media worship the ground he walks on and the air he breathes. The media are unable to get any critical quotes from his investors, and nobody wants to be caught disagreeing with the Oracle of Omaha – after all he’s been right more often than wrong – and so we only get positive puff pieces. On the rare occasion when Berkshire Hathaway stock declines more than the market, you see an article asserting that “Buffett has lost his magic touch,” but these articles are usually followed by stellar performance by Berkshire. Though Buffett deserves admiration – he is brilliant and likable and he has achieved incredible returns for his investors over the last half-century – he should not be canonized, and not everything he does or says is the ultimate truth. Most investors agree with Buffett’s criticism of Kraft’s decision to buy a fairly valued (or overvalued) Cadbury at 22 times earnings (over the past 15 years, its average price-to-earnings ratio has been 21), using Kraft’s undervalued stock. Cadbury runs a global, noncyclical confectionary business that, if properly managed, should have a very high return on capital. Buffett, a shareholder of Kraft, was very public about his dismay – he said he felt poorer when Cadbury accepted Kraft’s increased offer. But though many agree with Mr. Buffett’s assessment of the Kraft/Cadbury deal, investors and media are completely ignoring Berkshire’s own, $30-billion-plus acquisition of a very cyclical, capital-intensive, not terrifically high-return-on-capital business – Burlington Northern. A railroad for which Mr. Buffett’s Berkshire will lay out 18 times earnings (over last 15 years its average P/E was 15); and to make it even worse, part of the deal will be financed by issuing what Buffett recently called “cheap” Berkshire stock. Burlington stock is not cheap, it is fairly priced at best, and likely overpriced. Also, Buffett owning Burlington Northern will not make the railroad business any more valuable. There is little value to be unlocked in this business, and Buffett will practice his usual hands-off approach. Warren Buffett of Berkshire Hathaway and Bill Ackman of hedge fund Pershing Square recently sat down with CNBC in two separate interviews. While the two men shared a talking point in the recent Kraft deal (they are both large shareholders), we thought it was interesting to hear their recent takes on the economy and markets. In his interview, hedge fund manager Bill Ackman says that you are buying Kraft (KFT) at less than 14 times earnings and get a 4% dividend yield. He liked the fact that Kraft used a limited amount of shares (and used more cash) in the deal and in the end paid a fair price to get the deal done. As we covered earlier, Kraft is now Pershing Square’s largest holding. Ackman argues that Kraft’s purchase of confectioner Cadbury now makes Kraft a more ‘defensive’ play. Obviously it will take a bit of time to integrate the two businesses, but the Pershing Square hedge fund manager points out that Kraft has done it numerous times before with other transactions. 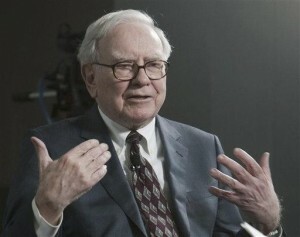 Moving next to Warren Buffett, we see that he shares a different opinion on the matter of the Kraft and Cadbury deal. Below he gives his thoughts on Wells Fargo (WFC), the economy, Ben Bernanke, and much more. We’ve followed these two gentlemen extensively before and have covered numerous resources such as Warren Buffett’s recommended reading list, Pershing Square’s research on General Growth Properties (GGWPQ). For more insight from these two big time investors, head to our resources on Warren Buffett as well as our resources on Bill Ackman.